Does everyone believe in the Trinity? “It is exegesis of a mischievous if pious sort that would find the doctrine of the Trinity in the plural form elohim [God]” (“God,” Encyclopedia of Religion and Ethics) “Only one, the Father, can absolutely be termed the ‘only true God,’ not at the same time Christ (who is not even in I John 5:20 the true God…). Jesus, in unity with the Father, works as his commissioner (John 10:30), and is His representative (John 14:9, 10) (Professor H.A.W. Meyer, Commentary on the New Testament. The quotation is from his comment on John 17:3). It is customary for students of the Bible to refer to Jesus as God and to insist that belief in a Trinity of three co-equal, co-eternal Persons in the One God is the hallmark of true faith. Many recognized Bible scholars do not think, however, that Jesus is called God, in a Trinitarian sense, in the Scriptures. Distinguished experts on the Bible, past and present, maintain that the doctrine of a Tri-personal God is nowhere taught in Scripture. A popular recent discussion of Christianity states that the doctrine of the Trinity is “unquestionably one of the most difficult Bible doctrines to understand” (Ron Rhodes, The Heart of Christianity, Harvest House, 1996, p. 50). One of the most perplexing questions facing Trinitarians is the fact that in Mark 13:32 Jesus confessed ignorance as the Son of the Father (i.e., Son of God) about the Second Coming. How can Jesus be God if he is not all-knowing? Why indeed did the Father of Jesus have to give His risen and glorified Son a revelation if Jesus know all things? (Rev. 1:1). Can Trinitarians provide honest answers to these questions? In no text did Jesus ever say he was God. In Mark 10:18 he distinguished between himself and God who alone is absolutely good. Why if Jesus is God did he isolate his Father as the only one who is absolutely good? 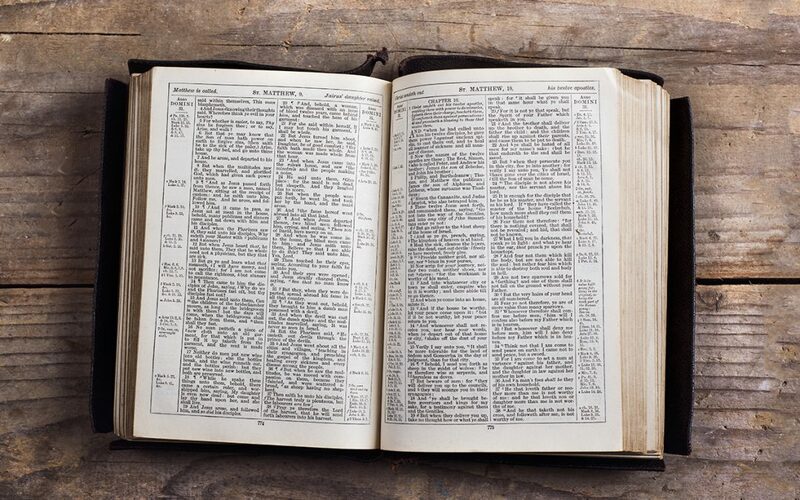 The fair way to investigate the question as to who is the Supreme God in the Bible is to start with that 75% of our Bibles we call the Old Testament. These were the Scriptures on which Jesus had been nourished. One very simple fact does not often receive the attention it deserves: The Old Testament describes God with singular pronouns over 11,000 times. Singular pronouns tell us that God is a single Individual. What if you picked up a book in which the father of a family was described by the singular pronouns “I,” “me,” and “him” hundreds of times? If that same father then said, “Let us take a vacation” would you immediately think that the father was really more than one person? Or would you think that the father was inviting others to join him, a single individual, in an activity? Amazingly when some Bible readers arrive at Genesis 1:26 and they read that God said “Let us make…”, they leap to the conclusion that God is more than one Person. There is no logical reason for this. Scripture describes God as “I”, “He,” “Him,” “Me” thousands of times. When on a very rare occasion God says, “Let us…” it means that God, who is one person, involves others with Him. How is it that Bible readers imagine “Let us…” to mean “Let us THREE…” The verse says nothing about three members of a Godhead. Real truth-seekers will make an effort not to start their investigation with the assumption that the Trinity is a true biblical teaching. They will begin with an open mind and look for clear evidence. Is there such evidence in the Old Testament? Many have abandoned Genesis 1:26 as any indication of plurality in God. The NIV study note, widely available, provides the public with the needed information pointing out with many commentaries that God was addressing His attendant council of angels. There is no shred of proof for the Trinity in Genesis 1:26. In a long book on the Trinity (The Trinity, Evidence and Issues), Robert Morey claims that the Hebrew word “one” (echad) really means “more than one”! He states without evidence from a lexicon that “one” means “compound oneness.” Morey includes a footnote to p. 25 of the standard Lexicon of Biblical Hebrew for support. But the page he appeals to contains not a word of support for his theory that “one” really means “compound unity.” The lexicons rightly define “one” as the cardinal number “one.” Echad is the word for “one” in counting. Imagine the chaos of communication if “one” really means more than one. Ecclesiastes 4:9 speaks of two being better than one (echad). The use of “one” in the sentence “The two shall become one flesh” does not mean that “one” is really plural. It means that two human beings in marriage become one (not two) things. The idea of plurality is not found in the word “one” at all. It is found in the context: male and female human persons. The lexicons of Hebrew tell us correctly that “one” means “one single.” Echad is used about 770 times and there is never any doubt that it means “one,” not two or more. In the central creed of Israel and of Jesus (Deut 6:4; Mark 12:28ff.) the LORD is described as “one Lord,” i.e. “one single Lord.” One single Lord means one Person, not three. Opposition to the Trinity is not confined to so-called “cults.” That is a public myth. How many know what Sir Isaac Newton, John Locke and John Milton have in common? They are recognized as among the most intelligent Bible students of the seventeenth century. All objected strongly to the doctrine of the Trinity. These men cannot just be dismissed as ill-educated or prejudiced. They had very good reasons for what they believed and defended in writing. All three were vigorous anti-Trinitarians. So also was Thomas Jefferson, who examined the Trinitarian question carefully in the light of the Bible. How many know that Harvard University at one time expressed non-Trinitarian views? Many contemporary biblical scholars recognize that the Trinity is a post-biblical development. One of the cruelest episodes in church history occurred when the reformer Calvin used the strong arm of the Catholic Church to burn at the stake a brilliant linguist, physician, geographer and Bible expert, Michael Servetus. The burning of others over an issue of doctrine is absolutely forbidden by the Bible and may cause some wonder about the spirit which drives such persecuting zeal over the definition of who God is. (For a recent fine account of this horrible cruelty in support of the Trinitarian cause, see Marian Hillar, The Case of Michael Servetus: The Turning Point in the Struggle for Freedom of Conscience, Edwin Mellen Press, 1997). When Did God Become the Father of Jesus? Some authorities will expect the public to swallow a considerable piece of misinformation (nonsense would be a fairer description!). They will say that there is “a conversation between members of the Godhead in Ps. 2 and Ps. 110:1.” Truth-seekers should look carefully and prayerfully at these two passages. Psalm 2:7 reports the One God, Yahweh (the LORD) as addressing the Son, the Messiah. The Father says, “TODAY I have begotten you.” To beget means to become a Father of a child. Now does the word “today” mean “eternity”? The suggestion is completely destructive of the meaning of God’s revelation. “Today” obviously means today. Today is not eternity. There is no basis at all for the Trinity in Psalm 2:7. Without an “eternally begotten” Son there can be no Trinity. Psalm 2:7 contradicts the Trinity and tells us that there was a time before the begetting of the Son. Luke 1:35 tells us when the Son was begotten. It was some two thousand years ago in Palestine. When the power of God came over Mary the Son of God came into existence as the begotten Son of the Father (see Luke 1:35, Matt. 1:20, “begotten”). There is no such person as an “eternally begotten Son” in the Bible. This is an invention of post-biblical Church Fathers. Much less is there a conversation between members of the Godhead in Psalm 110:1. In that Psalm the LORD speaks to “my lord.” The ‘lord’ in question is not the LORD (Yahweh) but ADONI (“my lord”). ADONI in all of its 195 occurrences in the Old Testament means not God, but a human (or occasionally angelic) superior. There is another word for God — ADONAI — which refers to God in all of its 449 occurrences. ADONAI and ADONI show us the biblical distinction between God and man. The Messiah in Psalm 110:1 is addressed by a human and not a divine title. That is why Paul wrote: “There is one God, the Father…” (I Cor. 8:4). “There is one God and one mediator between God and man, the MAN Messiah Jesus” (I Tim. 2:5). Jesus is the Lord Messiah (Luke 2:11; Matt. 16:16) and not the Lord God. Authorities who claim that the second Lord in Psalm 110:1 is ADONAI (God) either cannot read the Hebrew or have not checked the facts carefully. Ron Rhodes in his Reasoning from the Scriptures with Jehovah’s Witnesses, p. 162 says: “Ask the JW’s: Did you know that the same word used for “Lord” (adonai) in Ps. 110:1 of Jesus Christ is also used of the Father numerous times in Scripture…?” The argument backfires on him, because the word in Psalm 110 is not adonai. It is adoni, which is never a reference to Deity and always (195 times) a reference to someone who is not God. The Messiah is the Son of God, not God Himself. The Messiah is the perfect agent of God, speaking the words of God as God’s representative. Jesus died, but God is incapable of death (immortal, I Tim. 6:16). Therefore Jesus cannot be God. Note carefully that the NIV closes the quotation marks at that point. A new speaker then says: “And now the Sovereign LORD has sent me with his Spirit.” The Messiah is here represented as being sent by the LORD (God). The vast majority of Trinitarian scholars would never advance this passage as any evidence for the Trinity. “Because the Trinity is such an important part of later Christian doctrine, it is striking that the term does not appear in the NT. Likewise the developed concept of three coequal partners in the Godhead found in later creedal formulations cannot be clearly detected within the confines of the canon” (Oxford Companion to the Bible, ed. Bruce Metzger, OUP, 1993, p. 782). “The word Trinity is not found in the Bible…. It did not find a place formally in the theology of the church until the fourth century” (Illustrated Bible Dictionary, Intervarsity Press, Tyndale House Publishers, 1980, part 3, p. 1). The Trinity “is not directly and immediately the Word of God” (New Catholic Encyclopedia, 1967, Vol. XIV, p. 304). “In Scripture there is yet no single term by which the Three Divine Persons are denoted together. The word ‘Trias’ (of which the Latin ‘Trinitas’ is a translation) is first found in Theophilus of Antioch about 180 AD…. Shortly afterwards it appears in its Latin form of ‘Trinitas’ in Tertullian” (The Catholic Encyclopedia, 1912, Vol. 15, p. 47). “Hasty conclusions cannot be drawn from usage, for [Tertullian] does not apply the words [which were later applied to Trinitarianism] to Trinitarian theology” (Michael O’Carroll, Trinitas: A Theological Encyclopedia of the Holy Trinity, 1987, p. 208). “There is in the Old Testament no indication of distinctions in the Godhead; it is an anachronism to find either the doctrine of the Incarnation or that of the Trinity in its pages” (“God,”Encyclopedia of Religion and Ethics, Vol. 6, p. 254). “Theologians today are in agreement that the Hebrew Bible does not contain a doctrine of the Trinity” (The Encyclopedia of Religion, ed. Mircea Eliade, Macmillan Publishing Company, 1987, Vol. 15, p. 54). “The doctrine of the Trinity is not taught in the Old Testament” (New Catholic Encyclopedia, 1967, Vol. XIV, p. 306). “The Old Testament tells us nothing explicitly or by necessary implication of a Triune God who is Father, Son and Holy Spirit…. There is no evidence that any sacred writer even suspected the existence of a [Trinity] within the Godhead…. Even to see in the Old Testament suggestions or foreshadowings or ‘veiled signs’ of the Trinity of persons, is to go beyond the words and intent of the sacred writers” (Edmund J. Fortman, The Triune God, Baker Book House, 1972, pp. xv, 8, 9). “There is no break between the Old Testament and the New. The monotheistic tradition is continued. Jesus was a Jew, trained by Jewish parents in the Old Testament scriptures. His teaching was Jewish to the core; a new gospel indeed but not a new theology…And he accepted as his own belief the great text of Jewish monotheism: Hear, O Israel, the Lord our God is one God” (L.L. Paine, A Critical History of the Evolution of Trinitarianism, Houghton Mifflin and Co., 1900, p. 4). “The Old Testament can scarcely be used as authority for the existence of distinctions within the Godhead. The use of ‘us’ by the divine speaker (Gen. 1:26, 3:32, 11:7) is strange, but it is perhaps due to His consciousness of being surrounded by other beings of a loftier order than men (Isa. 6:8)” (A.B. Davidson, “God,” Hastings Dictionary of the Bible, Vol. II, p. 205). “From Philo onward, Jewish commentators have generally held that the plural [Gen. 1:26, ‘Let us make man….’] is used because God is addressing his heavenly court, i.e., the angels (cf. Isa. 6:8). [This is also the explanation given by the NIV Study Bible] From the Epistle of Barnabas and Justin Martyr, who saw the plural as a reference to Christ, Christians have traditionally seen this verse as foreshadowing the Trinity. It is now universally admitted that this was not what the plural meant to the original author” (Gordon Wenham, Word Commentary on Genesis, p. 27). The mistake of Justin Martyr (2nd century) had devastating effects. By proposing that the Son of God, rather than the logos, preexisted, Justin created the problem of two divine beings (God and the Son) which led eventually to the Trinity. This novel doctrine was written into the traditional creeds in 325 and 451 AD. But this was over 300 years after the time of the New Testament. Is the Trinity in the New Testament? “No Apostle would have dreamed of thinking that there are three divine Persons” (Emil Brunner, Christian Doctrine of God, Dogmatics, Vol. 1, p. 226). “Theologians agree that the New Testament also does not contain an explicit doctrine of the Trinity” (Encyclopedia of Religion, Vol. 15, p. 54). “The New Testament writers…give us no formal or formulated doctrine of the Trinity, no explicit teaching that in one God there are three equal divine persons…. Nowhere do we find any Trinitarian doctrine of three distinct subjects of divine life and activity in the same Godhead” (Fortman, The Triune God, pp. xv, xvi, 16). “Neither the word Trinity nor the explicit doctrine appears in the New Testament” (The New Encyclopedia Britannica, 1985, Vol. 11, p. 928). “As far as the New Testament is concerned one does not find in it an actual doctrine of the Trinity” (Bernard Lohse, A Short History of Christian Doctrine, Philadelphia: Fortress Press, 1966, p. 38). “The New Testament does not contain the developed doctrine of the Trinity” (The New International Dictionary of New Testament Theology, ed. Colin Brown, Zondervan, 1976, Vol. 2, p. 84). “The Bible lacks the express declaration that the Father, the Son and the Holy Spirit are of equal essence” (Karl Barth, cited in the New International Dictionary of New Testament Theology, above). “Jesus Christ never mentioned such a phenomenon, and nowhere in the New Testament does the word Trinity appear. The idea was only adopted by the Church three hundred years after the death of our Lord” (Arthur Weigall, The Paganism in our Christianity, G.P. Putnam and Sons, 1928, p. 198). “Primitive Christianity did not have an explicit doctrine of the Trinity such as was subsequently elaborated in the creeds” (New International Dictionary of New Testament Theology, Vol. 2, p. 84). “The early Christians, however, did not at first think of applying the TRINITY idea to their own faith. They paid their devotions to God the Father and to Jesus Christ, the Son of God, and they recognized the…Holy Spirit; but there was no thought of these three being an actual Trinity, coequal and united in One” (Arthur Weigall, The Paganism in Our Christianity, p. 197). “At first the Christian faith was not Trinitarian…It was not so in the apostolic and sub-apostolic ages, as reflected in the New Testament and other early Christian writings” (Encyclopedia of Religion and Ethics, ed. James Hastings, 1922, Vol. 12, p. 461). “The formulation ‘One God in three Persons’ was not solidly established, certainly not fully assimilated into Christian life and its profession of faith, prior to the end of the 4th century…. Among the Apostolic Fathers, there had been nothing even remotely approaching such a mentality or perspective” (New Catholic Encyclopedia, 1967, Vol. 14, p. 299). “Fourth-century Trinitarianism did not reflect accurately early Christian teaching regarding the nature of God; it was, on the contrary a deviation from this teaching” (The Encyclopedia Americana, p. 1956, p. 2941). “The New Testament gives no inkling of the teaching of Chalcedon. That council not only reformulated in other language the New Testament data about Jesus’ constitution, but also reconceptualized it in the light of the current Greek philosophical thinking. And that reconceptualization and reformulation go well beyond the New Testament data” (A Christological Catechism, Paulist Press, p. 102). Does the Word elohim (God) Imply That There Is More than One Person in the Godhead? “The fanciful idea that Elohim referred to the Trinity of persons in the Godhead hardly finds now a supporter among scholars. It is either what the grammarians call the plural of majesty, or it denotes the fullness of divine strength, the sum of the powers displayed by God” (William Smith, A Dictionary of the Bible, ed. Peloubet, MacDonald Pub. Co., 1948, p. 220). “Elohim must rather be explained as an intensive plural, denoting greatness and majesty” (The American Journal of Semitic Language and Literature, 1905, Vol. XXI, p. 208). “Early dogmaticians were of the opinion that so essential a doctrine as that of the Trinity could not have been unknown to the men of the Old Testament…No modern theologian…can longer maintain such a view. Only an inaccurate exegesis which overlooks the more immediate grounds of interpretation can see references to the Trinity in the plural form of the divine name Elohim, the use of the plural in Genesis 1:26 or such liturgical phrases as three members of the Aaronic blessing of Numbers 6:24-26 and the Trisagion of Isaiah 6:3” (The New Schaff-Herzog Encyclopedia of Religious Knowledge, Vol. 12, p. 18). “The plural form of the name of God, elohim, in the Hebrew Scriptures has often been adduced as proof of the plurality of persons in the Godhead…Such use of Scripture will not be likely to advance the interests of truth, or be profitable for doctrine…The plural of elohim may just as well designate a multiplicity of divine potentialities in the deity as three personal distinctions, or it may be explained as the plural of majesty and excellency. Such forms of expression are susceptible of too many explanations to be used as valid proof texts of the Trinity” (Milton Terry, Biblical Hermeneutics, p. 587). Jesus never said “I am God.” He always claimed to the Messiah, the Son of God. “Jesus is not God but God’s representative, and, as such, so completely and totally acts on God’s behalf that he stands in God’s stead before the world…The gospel [of John] clearly states that God and Jesus are not to be understood as identical persons, as in 14:28, ‘the Father is greater than I'” (Jacob Jervell, Jesus in the Gospel of John, 1984, p. 21). “Apparently Paul did not call Jesus God” (Sydney Cave, D.D., Doctrine of the Person of Christ, p. 48). “Paul habitually differentiates Christ from God” (C.J. Cadoux, A Pilgrim’s Further Progress, pp. 40, 42). “Paul never equates Jesus with God” (W.R. Matthews, The Problem of Christ in the 20th Century, Maurice Lectures, 1949, p. 22). “Paul never gives to Christ the name or description of ‘God'” (Dictionary of the Apostolic Church, Vol. 1, p. 194). “When the New Testament writers speak of Jesus Christ, they do not speak of Him nor do they think of Him as God” (J.M. Creed, The Divinity of Jesus Christ, pp. 122-123). “Karl Rahner [leading Roman Catholic spokesman] points out with so much emphasis that the Son in the New Testament is never described as ‘ho theos’ [the one God]” (A.T. Hanson,Grace and Truth, p. 66). “The clear evidence of John is that Jesus refuses the claim to be God…Jesus vigorously denied the blasphemy of being God or His substitute” (J.A.T. Robinson, Twelve More New Testament Studies, pp. 175, 176). “In his post-resurrection heavenly life, Jesus is portrayed as retaining a personal individuality every bit as distinct and separate from the person of God as was his in his life on earth as the terrestrial Jesus. Alongside God and compared with God, he appears, indeed, as yet another heavenly being in God’s heavenly court, just as the angels were — though as God’s Son, he stands in a different category, and ranks far above them” (Bulletin of the John Rylands Library, 1967-68, Vol. 50, p. 258). “What, however, is said of his life and functions as the celestial Christ neither means nor implies that in divine status he stands on a par with God Himself and is fully God. On the contrary, in the New Testament picture of his heavenly person and ministry we behold a figure both separate from and subordinate to God” (Ibid., pp. 258, 259). “The fact has to be faced that New Testament research over, say, the last thirty or forty years has been leading an increasing number of reputable New Testament scholars to the conclusion that Jesus…certainly never believed himself to be God” (Ibid., p. 251). “When [first-century Christians] assigned Jesus such honorific titles as Christ, Son of Man, Son of God and Lord, these were ways of saying not that he was God but that he did God’s work” (Ibid., p. 250). “The ancients made a wrong use of [John 10:30, “I and the Father are one”] to prove that Christ is…of the same essence with the Father. For Christ does not argue about the unity of substance, but about the agreement that he has with the Father” (John Calvin, Commentary on John). “The Pauline Christ who accomplishes the work of salvation is a personality who is both human and superhuman, not God, but the Son of God. Here the idea, which was to develop later, of the union of the two natures is not present” (Maurice Goguel, Jesus and the Origins of Christianity, Harper, 1960). “Jesus is never identified simpliciter [absolutely] with God, since the early Christians were not likely to confuse Jesus with God the Father” (Howard Marshall, “Jesus as Lord: The Development of the Concept,” in Eschatology in the New Testament, Hendrickson, p. 144). Is the Holy Spirit a Third Person? It is completely misleading to read into the Bible a third Person, the Holy Spirit. “The spirit of Elijah” (Luke 1:17) is not a different person from Elijah. Nor is “the Spirit of God” a different person from the Father. The Holy Spirit is the operational presence of the mind and influence of God as well as His character. It is God extended to His creation. “Although this spirit is often described in personal terms, it seems quite clear that the sacred writers [of the Hebrew Scriptures] never conceived or presented this spirit as a distinct person” (Edmund Fortman, The Triune God, p. 9). “Nowhere in the Old Testament do we find any clear indication of a Third Person” (The Catholic Encyclopedia, 1912, Vol. 15, p. 49). “The Jews never regarded the spirit as a person; nor is there any solid evidence that any Old Testament writer held this view…The Holy Spirit is usually presented in the Synoptic gospels (Matt., Mark, Luke) and in Acts as a divine force or power” (Edmund Fortman, The Triune God, pp. 6, 15). “The Old Testament clearly does not envisage God’s spirit as a person…God’s spirit is simply God’s power. If it is sometimes represented as being distinct from God, it is because the breath of Yahweh acts exteriorly…The majority of New Testament texts reveal God’s spirit as something, not someone; this is especially seen in the parallelism between the spirit and the power of God” (New Catholic Encyclopedia, 1967, Vol. 13, pp. 574, 575). “On the whole the New Testament, like the Old, speaks of the spirit as a divine energy or power” (W.E. Addis and Thomas Arnold, A Catholic Dictionary, 1960, p. 810). “The third Person was asserted at a Council of Alexandria in 362…and finally by the Council of Constantinople of 381” (A Catholic Dictionary, p. 812). “[Matt. 28:19] proves only that there are the three subjects named,…but it does not prove, by itself, that all the three belong necessarily to the divine nature, and possess equal divine honor…This text, taken by itself, would not prove decisively either the personality of the three subjects mentioned, or their equality or divinity” (McClintock and Strong, Cyclopedia of Biblical, Theological and Ecclesiastical Literature, 1987, Vol. X, p. 552). “Of our thoughtful men, some regard the Holy Spirit as an operation, some as a creature and some as God; while others are at a loss to decide, seeing that the Scripture determines nothing on the subject” (Oratio 38: De Spiritu Sancto). “In none of these instances [including John 1:1] is theos [God] used in such a manner as to identify Jesus with him who elsewhere in the New Testament figures as ‘ho theos,’ that is, the Supreme God…If the New Testament writers believed it vital that the faithful should confess Jesus as ‘God,’ is the almost complete absence of just this form of confession in the New Testament explicable?” (Bulletin of the John Rylands Library, 1967-68, Vol. 50, p. 253). “The ‘word’ of God in the Old Testament [which sets a pattern for the New Testament] is sometimes spoken of as if it had an objective existence, and possessed a native power of realizing itself. The ‘wisdom’ of God in some passages is no more an attribute of God, but a personification of his thought. In Proverbs 8 ‘wisdom’ is God’s world-plan or conception, the articulated frame-work of the universe as a moral organism. Its creation is the first movement of the divine mind outward. Being projected outside of the mind of God, it becomes the subject of His own contemplation; it is ‘with God'” [Cp. John 1:1, ‘the word was with God,’ which does not mean that the word was another person] (A.B. Davidson, Hastings Bible Dictionary, art. God, Vol. II, p. 205, emphasis added). English translations of the Bible from the Greek before the KJV rendered the beginning of John 1: “All things were made through it and without it nothing was made that was made. In it was life….” Similarly a number of modern German and French translations describe the word as “it,” not “him.” There is no reason, therefore, to think of the word as a Person, until it becomes embodied in Jesus in John 1:14. Remember that “word” in the Hebrew Bible, the background to the New Testament, never meant a Person in all of its 1455 occurrences. There is no indication in the Old Testament that the Messiah would be a person before his conception. The very opposite was taught: The Messiah would expressly not be God, but a unique, final “prophet like Moses,” coming into being from a family in Israel (see Deut. 18:15-19; Acts 3:22; 7:37). “We are not to suppose that the apostles identified Christ with Jehovah; there were passages which made this impossible, for instance Psalm 110:1, Malachi 3:1” (Charles Bigg, D.D., Regius Professor of Ecclesiastical History, Oxford, in International Critical Commentary on Peter and Jude, T&T Clark, 1910, p. 99). “Christendom has done away with Christianity without being quite aware of it” (Soren Kierkegaard, cited in Time magazine, Dec. 16, 1946, p. 64).